If you had told me a year ago that Microsoft had a Machine Learning platform that was capable of performing analysis of images and video I think I would have muttered something about pigs and flight. Pay attention, I am now taking my foot out of my mouth. I’ll be the first to admit when I’m wrong. Not only does Microsoft have a Emotion API capable of determining emotions in faces from image and video but they have an entire stable of machine learning APIs that they have labled “Cognitive Services”. I was first turned on to Microsoft’s machine learning APIs after reading the Economist’s article on tracking the facial expression of Hillary and Donald here. I was inspired to perform my own analysis of facial expressions using one of my favorite shows, Game of Thrones, as a sample. My intent is to provide a little guidance on using the Microsoft Emotion API and encourage some creativity in performing your own analysis. For this post I’ve chosen Python and some associated data science libraries. I want to give a lot of credit to Ben Heubl, a journalist who was part of the Economist article. Without the help of his post my analysis wouldn’t have been possible. As much as Microsoft has done to make their machine platform open to everyone, their documentation is almost non-existent. Hopefully this post can provide some assistance to those of you who are looking to get started with the Cognitive Services API. If you want to skip the explanation you can access my jupyter notebook here. First we need to import some libraries. In order to use Microsoft’s Cognitive Services API you need to sign up for a free API key here. Next we use Python’s Requests library to post and get data from the Microsoft API. In my sample I used a Game of Thrones Season 7 trailer that I found on youtube and converted to MP4. You can also point the API at a url for your video file and I suggest reading the API docs for details. A status code of ‘202’ is a success and means we can proceed with our analysis. Next we proceed with processing the result of our post of the video file. The following is a snippet of the dictionary that is created from the response. As you can see, Microsoft breaks the video clip into frames. For each frame it analyzes the faces in each frame and assigns a score for the emotions sadness, neutral, contempt, disgust, anger, surprise, fear, and happiness. Naively I thought that I would be able to parse the output and write this post in a day. The reality is I spent almost a week researching all the different ways I could parse dictionaries within lists within dictionaries. After a lot of cursing and and googling I realized I should have used the method that Ben used in his original article. Below is basically the same method with a little tweaking. Now we convert to a Pandas dataframe. Finally, we chart the averages of each emotion for the video clip. 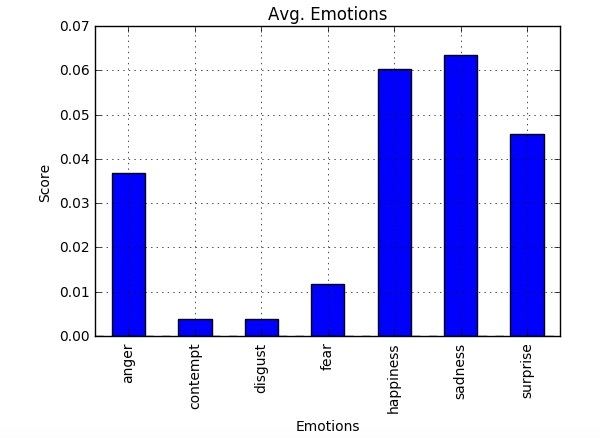 If you’re a Game of Thrones fan then it should come as no surprise to see sadness as the emotion with the highest average. I was surprised to see happiness as a close second. Maybe HBO didn’t want viewers to get to depressed on the final season and wanted to provide some balance. What really excites me is the potential uses for this API. Imagine Netflix performing emotion analysis on all their content and then feeding that into their recommendation engine for a more accurate prediction. (I’m pretty sure they are already doing this.) The use cases extend beyond media and could be used to assist people with Autism to better understand others emotions through facial expressions. I can see public speakers analyzing their own facial expressions as well as the crowd they are speaking to be more effective. This kind of analysis would have been considered fairy dust 5 years ago. With the help of Microsoft I was able to perform this on my laptop in a couple of hours. Microsoft might not be top of mind when it comes to AI and Machine Learning, but I’d watch out if I were Google and Amazon. Satya Nadella has a trick or two left up his sleeve.